This platinum white pearl sedan has an automatic transmission and is powered by a 1.5L I4 16V GDI DOHC Turbo engine. Equipped with that spritely motor it gets 8.2 L/100 km in the city and uses just 6.8 L/100 km out on the highway according to Transport Canada. Our Accord Sedan's trim level is Sport. 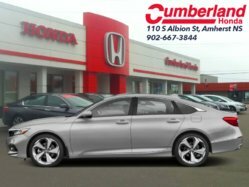 This CVT Sport trim has paddle shifters, aluminum wheels, full LED lighting with automatic on/off, automatic high beams, fog lights, adaptive cruise control, brake assistance, lane keep assistance, blind spot monitoring, and traffic sign recognition. 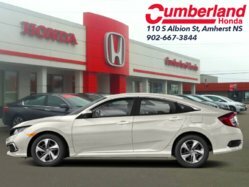 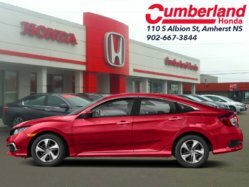 You also get HondaLink touchscreen display infotainment complete with Hands Free Link bluetooth, rear view camera, Apple CarPlay, Android Auto, and steering wheel audio controls. The interior luxury continues with heated front seats with leather trim, a leather steering wheel, a moonroof, and remote keyless entry and starting. 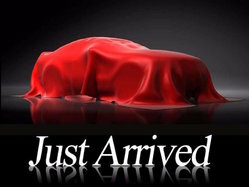 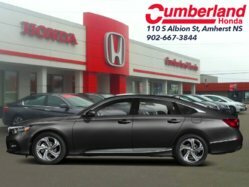 This vehicle has been upgraded with the following features: Sunroof, Heated Seats, Lane Keep Assist, Brake Assist, Blind Spot Assist, Adaptive Cruise Control, Apple Carplay.